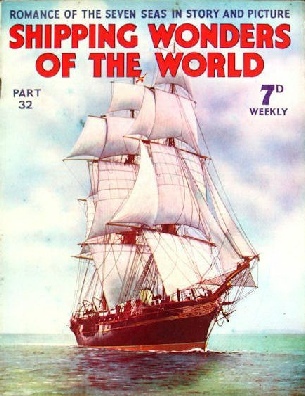 Part 32 of Shipping Wonders of the World was published on Tuesday 15th September 1936. 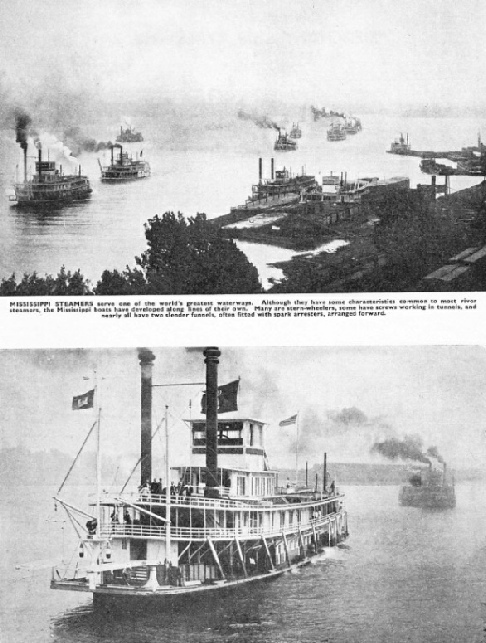 It included a centre photogravure supplement featuring ships on the Mississippi, which formed part of the article on the Mississippi “Father of Waters”. This week’s cover shows the Valhalla, a ship-rigged yacht built in 1892 at Leith for a private owner. She had a Thames measurement tonnage of 1490 and a gross tonnage of 1197. Her length was 239 ft 7 in, her beam 37 ft 2 in and depth 20 ft 8 in. After the war of 1914-18 she was sold to French owners and used as a cargo vessel, She foundered in December 1928. Concluding section of this article from part 31. BEACHED FOR REPAINTING on Prince of Wales Island, in the Torres Strait, between Australia and New Guinea. Here Pidgeon cleaned the Islander’s hull and gave her a coat of copper paint. 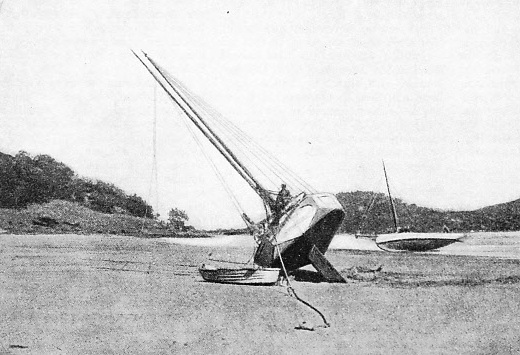 The yacht’s deep keel gave her a good list when beached. Her dinghy, 9 feet in length, is seen alongside. 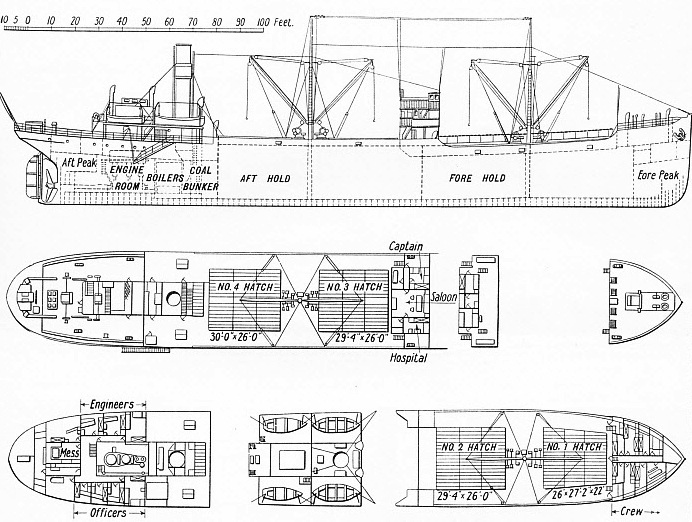 The ship shown in the drawing above is the N C Monberg. She was built at Copenhagen by Burmeister and Wain in 1928 for the Danish Coal Company, a concern which regularly brings cargoes of coal to that port. The company has a fleet of four vessels of which the N C Monberg is the largest. She has a length of 275 ft 9 in, a beam of 41 ft 4 in, and a depth of 19 feet. Propulsion is by a triple-expansion steam engine, with cylinders having diameters of 20½ in, 33 in and 54 in, and a common stroke of 36 in. Her gross tonnage is 2,301 and the vessel has a grain capacity of 159,000 cubic feet in her two holds. Her draught in fully-loaded conditions is 19 ft 6 in and her deadweight tonnage is 3,400. Noteworthy features are the large hatches. The bridge is narrow in the fore-and-aft direction. By her derricks and winches she is capable of handling a cargo herself should this be necessary. There is a short forecastle in which the crew are berthed, and this is followed by a forward well with two hatches. The mast, with its winches, is approximately at mid-length of the hold. Abaft this are the bridge structure and the forward end of the raised quarter-deck, and then the deck is clear, with two further hatches to the forward end of the engine casing, with its tall funnel. Engineer officers are berthed on the port side in the ‘tween decks at the after end and navigating officers on the starboard side. Although the N C Monberg is not a particularly attractive-looking vessel, she is utilitarian, and is typical of many ships operating in the North Sea trades. This is the twenty-fourth article in the series on Merchant Ship Types. One of the mightiest and most romantic rivers is the Mississippi. The first white man to see this great waterway was the Spanish explorer de Soto in 1542. Later, French explorers had the idea of sailing down the Mississippi in the hope that they would discover a new and shorter route to the Pacific and China. No regular navigation of the river was undertaken, however, until the middle of the eighteenth century, when the white man began to colonize the river valley. The river boats were, of course, almost the only means of transport that these colonists had in the days before railways, as the roads were very primitive. It is the steamboat, however, that one really associates with the Mississippi, and navigation on the river reached its peak towards the middle of the nineteenth century. 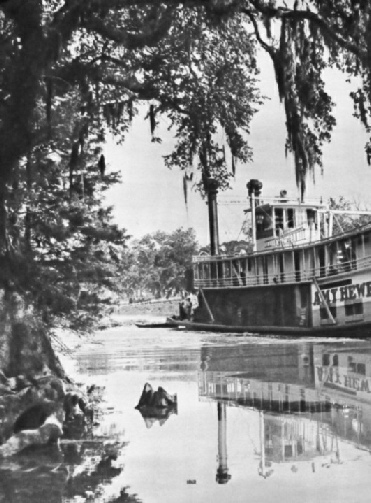 The Mississippi boat was akin to the river steamers of other parts of the world, yet had differences and peculiarities of her own. The romance of the Mississippi steamboats and show boats is not perhaps as great as it was, but hundreds of squat and elaborately decorated paddle steamers still ply on the muddy waters of the mighty river. This chapter is by C Hamilton Ellis and is the tenth article in the series on World Waterways. More than two hundred units of the Royal Navy carry out duties as auxiliary ships. They include surveying ships, monitors, sloops, target ships and many other types which render invaluable assistance to the Navy as well as to navigation in general. Admiralty charts are compiled in many instances from information supplied by HM Surveying Ships. The work of these ships is invaluable, and this year  HMS Challenger, the successor to the famous Challenger of 1872, is surveying the waters off the coast of Labrador. In the Australian Navy the HMAS Moresby is at present engaged in surveying the treacherous waters of the Great Barrier Reef off the north-east coast of Australia. These survey ships are only one branch of the interesting auxiliary units of the Royal Navy. This chapter is by Hector Bywater and is the eighth article in the series The Navy Goes to Work. ON A QUIET REACH of the Mississippi the paddles of the stern-wheelers cut through almost still water when reversing. The vessel in the picture is the Amy Hewes, 85 tons gross, built in 1903 at Franklin, Louisiana. She is 115 feet long, with a beam of 25 feet and a depth of 3 ft 3 in. Her engines develop 228 horse-power. MISSISSIPPI STEAMERS serve one of the world’s greatest waterways. Although they have some characteristics common to most river steamers, the Mississippi boats have developed along lines of their own. Many are stern wheelers, some have screws working in tunnels, and nearly all have two slender funnels, often fitted with spark arresters, arranged forward. 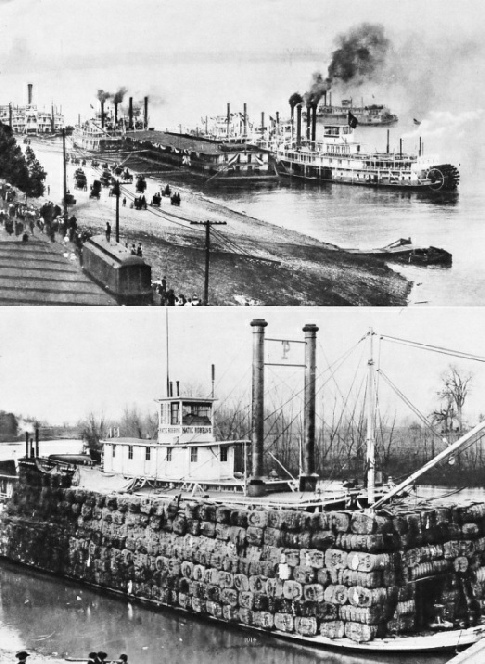 A RIVER STERN-WHEELER of 144 tons gross, the Mississippi is one of the more recent Mississippi steamboats. She was built at Dubuque, Iowa, in 1931, and her home port is St Louis, Missouri, She has a length of 126 feet, a beam of 26 feet 4 in, and a depth of 4 ft 11 in. Modern scientific methods have revealed that the greatest depth of the sea far exceeds the height o the world’s highest mountain. From the middle depths, in regions of perpetual night, strange luminous fish and other creatures are brought to light. In this chapter David Masters describes some of the wonderful specimens of fish that are brought up from the ocean depths. He deals with the discoveries made in the two years’ voyage of the Danish surveying expedition under Professor Johann Schmidt in the Dana. This began in 1920 [sic]. Four years later the New York Zoological Society specially equipped the steamer Arcturus for a cruise to West Indian waters and to the Galapagos Islands on the Pacific side of the Panama Canal. Not only did this expedition discover a large number of hitherto unknown species of fish, but also it was able to add considerably to the scientific knowledge of the Humboldt Current. This current sweeps up from the Antarctic to the northern Pacific coast of South America. On board the Arcturus were Dr William Beebe and Otis Barton, inventor of the famous bathysphere. In this steel globe Dr Beebe descended to the record depth of 3,028 feet, and many of the fish he saw were of types never caught in deep-sea dredges. A PARASITIC HUSBAND is attached to the forehead of the female Photocorynus spiniceps (bottom). The male has no separate existence but is a permanent parasitic incapable of eating or digesting food; his life is maintained through the blood vessels of the female and his sole function is to fertilize the eggs of the female. This photograph, as well as that of the Linophryne arborifer is from a model made by A. Fraser-Brunner for the Fish Gallery of the British Museum. FORMERLY A BATTLESHIP of 25,500 tons displacement completed in 1913, HMS Centurion (top) is now a wireless-controlled target ship. The speed and course of the Centurion are controlled by wireless from an accompanying destroyer, so that she forms a realistic and safe target for gunnery practice. Thousands of shells have hit the crewless Centurion, but the damage is quickly repaired. 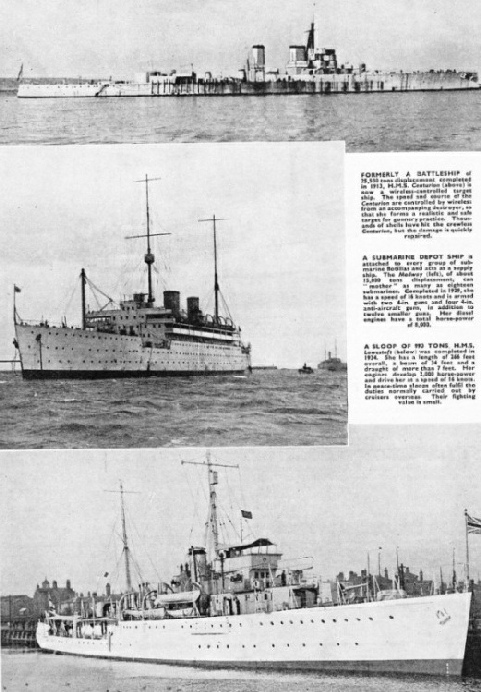 A SLOOP OF 990 TONS HMS Lowestoft (bottom) was completed in 1934. She has a length of 266 feet overall, a beam of 34 feet and a draught of more than 7 feet. The Lowestoft’s engines develop 2,000 horse-power and drive her at a speed of 16 knots. In peace-time sloops often fulfil the duties normally carried out by cruisers overseas. Their fighting value is small. DOWN RIVER AT FULL SPEED. From Pittsburgh, Pennsylvania, river steamers and tugs ply down the River Ohio to Cairo, Illinois, where the river flows into the Mississippi. The steamer illustrated is the Fred Hartweg, typical of the extravagantly decorated steamers that are becoming fewer and fewer with the advent of modern craft. SHOW BOAT. 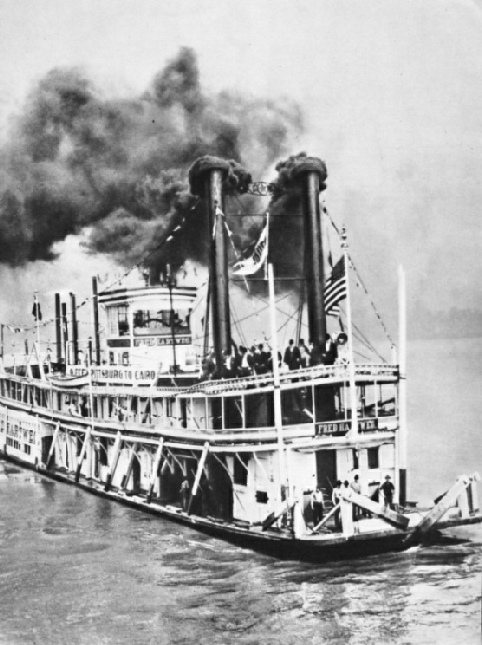 The only form of theatrical entertainment in the Mississippi valley was at one time the floating theatre or show boat. The vessels move from town to town and the arrival of the show boat generally caused great excitement. Alongside is the stern wheeler Mississippi. A FULL LOAD OF COTTON often mounts high over the decks of the Mississippi steamboats. The bales are loaded at riverside wharves and taken to the river ports for transshipment or discharge to railroads. 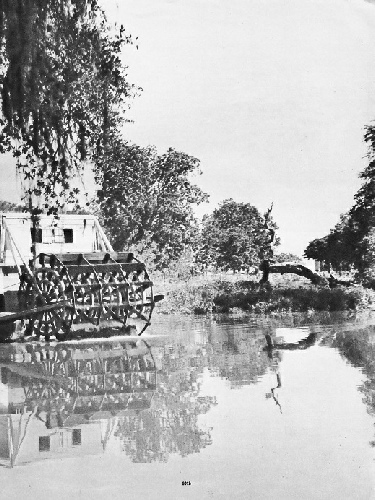 The lower photograph show how the bales are loaded in a typical stern-wheeler, the Katie Robbins. 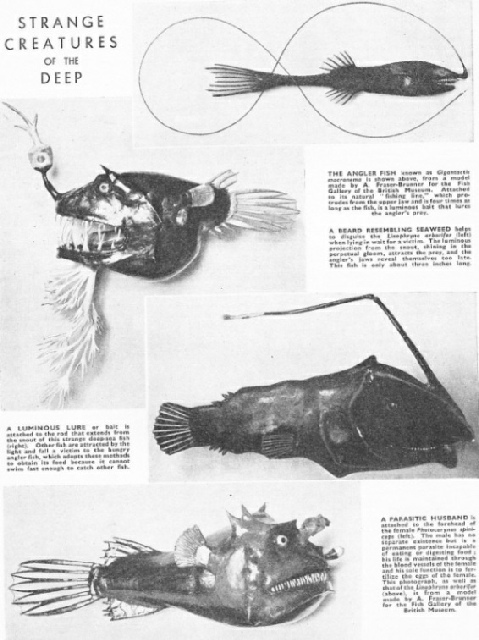 THE ANGLER FISH known as Gigantactis macronema is shown (top right) from a model made by A. Fraser-Brunner for the Fish Gallery of the British Museum. Attached to its natural “fishing line”, which protrudes from the upper jaw and is four times as long as the fish, is a luminous bait that lures the angler’s prey. A BEARD RESEMBLING SEAWEED helps to disguise the Linophryne arborifer (top left) when lying in wait for a victim. The luminous projection from the snout, shining in the perpetual gloom, attracts the prey, and the angler’s jaws reveal themselves too late. This fish is only about three inches long. A LUMINOUS LURE or bait is attached to the rod that extends from the snout of this strange deep-sea fish (middle right). Other fish are attracted by the light and fall a victim to the nugry angler fish, which adopts these methods to obtain its food because it cannot swim fast enough to catch other fish. In the sixteenth century the continuous assaults of the Moslem corsairs on Mediterranean trade routes aroused the Catholic nations of Southern Europe to action. On October 7, 1571, an Allied fleet routed the Turks off Lepanto (Navpaktos) in the Gulf of Corinth. By 1571 the Turks had been driven out of Spain and western Europe, but their ships were still a menace to Mediterranean traffic. Under the leadership of Don John of Austria, the combined fleets of the Holy League met the Turkish Navy in the Gulf of Corinth and inflicted a crushing defeat. Though Turkey still continued to dominate eastern Europe, her power at sea and in western Europe was gone for ever. One fact worthy of note in this connexion is that the type of Mediterranean galley used by both fleets at the Battle of Lepanto was in many ways similar to the type used by the Greek fleet at the Battle of Salamis in 480 BC. So well adapted was the type for the purposes of naval warfare in the Mediterranean that, though northern nations were inclined to despise it, it had persisted, little altered, for two thousand years. This chapter is by Lieut-Com E. Keble Chatterton and is the second article in the series on Decisive Naval Actions. The article is concluded in part 33. 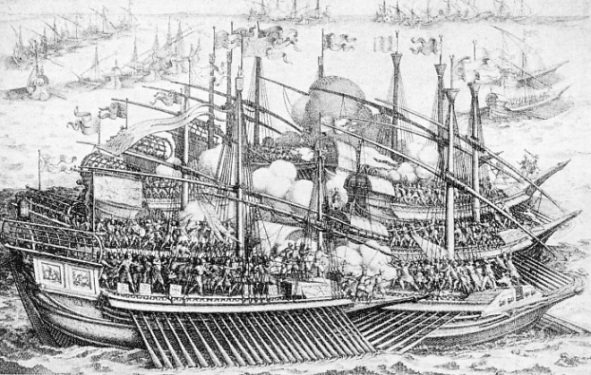 GALLEYS OF SPAIN, VENICE AND THE PAPAL STATES in action against the Turkish fleet. The Moslems had 333 vessels, of which 230 were galleys, the rest being either galleasses or small craft. The Allied fleet numbered 271. Don John of Austria, the Allied Commander-in-Chief, was only twenty-five years old at the time. The Turks were commanded by Ali Pasha.